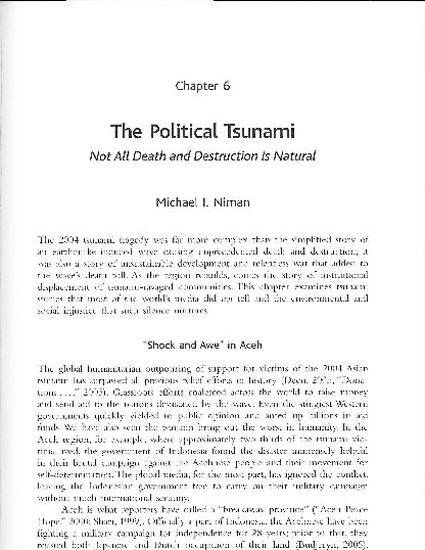 "The Political Tsunami: Not all Death and Destruction is Natural" by Michael I Niman, Ph.D. Unlike many disasters that befall the Third and Fourth Worlds, the 2004 Tsunami was both large and unique enough to dominate the western press. The stories in the mainstream media, however, were rather simplistic, sticking to a feel good script of nations uniting to offer aid to the tidal wave’s unfortunate victims. Meanwhile, without much media attention, the Indonesian government used the cover of the Tsunami and the ensuing relief efforts, to intensify its war against rebels in its break-away Ache province – which suffered from the brunt of the Tsunami. Also ignored by the western mass media, was the fact that much of the Tsunami damage was actually the result of irresponsible shoreline development which removed mangroves and other natural barriers that historically have tempered the force of tidal waves. And finally, the western mass media played down the importance that oral history served in equipping indigenous people to both recognize the oncoming catastrophe, and to take immediate action to save themselves – at the same time westernized peoples stood transfixed staring in confusion at the oncoming wave that would claim their lives. This chapter examines mass media coverage of the Tsunami and discuss how the media dumbed down the story to both avoid complexities and having to report on the uncomfortable realities of regional politics.